Church reformers were determined to stop men whose hands had been stained with blood from touching holy things. And so the popes conceived the idea of feudal knights into a militia of Saint Peter that was to be controlled by the clergy. However, the Templar Knights were more of a revival of medieval principles. With the pressures of the church for a perfect Christian Knighthood, blood was only meant to be shed in the name of a glorious reward for slaying the foe. The Soldiers of Christ would kill swiftly, would serve his interests in dying, and Christs interests in killing. A contradiction at best where those that protected the word of God would be restricted from holy things, yet when that word was challenged it was met by Christs Soldiers who had no protection themselves. The leader of the Templars, Hugues de Payns assured the Templars that they were not killing with greed in mind. They were punishing the unjust and unbelievers, seizing the booty that was streaked in sin. During this time and under Payns rule, most of the Templars time was spent plundering. The Templars erected many buildings in the west including preceptories, churches, and granges for administration purposes. They were simplistic and utilitarian in form with of course a few exceptions. There was no dictated form of Templar church architecture. Over the years, misconceptions about the circular construction of temples in Paris have led people to believe that every circular building was constructed by the Templars. However, that was not the case. Furthermore, the Templars did not the believe that money should be spent on elaborate church construction and ornate accessories. Furthermore, allowing the construction of overblown and over indulgent European castles would only be an economic liability. This photograph is of a Masonic Knights Templar symbol showing a cross within a crown inside a Maltese cross, which has the Latin phrase, “in hoc signo vinces.” The phrase means “in this sign you shall conquer” and was used by Constantine as a military motto in the early 4th Century. Joe Beine’s photographs on Flickr. Seven Lost Treasures to be Found... by You? The Master of the Knights Templar's great seal was double-sided and showed the picture of The Dome of the Rock on one side and the Order's symbol of two knights on one horse on the other side. There was also a smaller, single-sided seal, which showed the Dome of the Rock (or the circular dome of the Holy Sepulchre). A different symbol was adopted by each and every Grand Master. In addition, these seals were kept under close watch, often locked in a compartment that could only be opened by a small number of people. The Grand Master and his highest two officials were the only holders of the keys. Used on the Seal of Etienne de Til-Chatel, lord of Pichanges, Preceptor of La Fontenotte. Representation of a dove, facing backwards and grasping an olive branch within its beak. From Hugues de Payens period. Hand carved Grand Seal. Alike wax imprints were found on official documents addressed to Hugues de Payens. 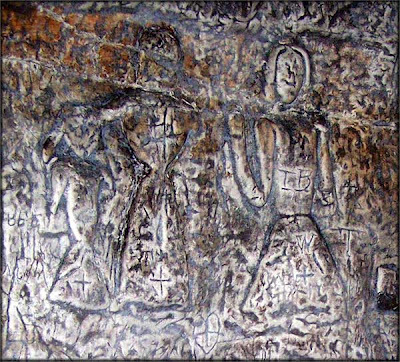 The carvings in the cave include four saints known to have been revered by the Templars. Below the original entrance is St. Christopher, patron saint of travellers, with the child Jesus on his shoulder and staff in hand. Moving to the left high up on the west part of the wall is St. Katherine for whom the Templars had a special regard as it was on St. Katherine's day in 1177 that they had a notable victory over the Saracen Saladin. Farther to the left is St. Lawrence who was martyred on the gridiron. Rosslyn Chapel was built over a decade after the dissolution of the Templar order, however several symbols can be found all around the chapel on the ceiling and moldings, and also on the walls and sculptures. However, as documented by St. Clairs, the symbols did not appear until the late 1800's when restoration work took place instructed by Edinburgh architect David Bryce, a known Freemason. The connection of the symbols for the Templars and the Masons has always been under scrutiny, however scholars depend on history, and history makes it clear that their was so connection between the two orders. Although, the carvings in the chapel display the Masons as direct descendants of the Templars, which may tell another story. Many of the Templar legends are associated with the Order's early occupation of the Temple Mount in Jerusalem and speculation about what relics the Templars may have found there, such as the Holy Grail or the Ark of the Covenant. These relics have often been portrayed in Hollywood Blockbusters like "National Treasure" and the 'Da Vinci Code". During the Templar trials, a relic came under fire being described as cat, a bearded head, or in some cases as Baphomet. This accusation of idol worship levied against the Templars has also led to the modern belief by some that the Templars practiced witchcraft. However, modern scholars generally explain the name Baphomet from the trial documents as simply a French misspelling of the name Mahomet (Muhammad). I like this post, your detail is great right down to the seal used by the head Templar. Good photos also. When we were in London last year, we made our upteenth visit to Temple Church. The original 12th century Templar structure has been incorporated into a much larger 19th & 20th century church building, but the historic circle is still very much in evidence. And, because London's lawyers rented the property after the dissolution of the Templar Knights, the Templar name lives on in the Temple Bar, and the Inner and Middle Temple of the Britsih legal system. I have been interested in the Knights Templar for awhile now, but I really only know small tidbits of information. This post has increased my interest and my knowledge greatly. Thanks so much. This was a great subject. so much information, yet so many inconsistencies. You are so lucky, I would have loved to see that. I'm a barrister, and a member of the Honourable Society of the Middle Temple. Very little of the Temple Church is 19th or 20th century, though.